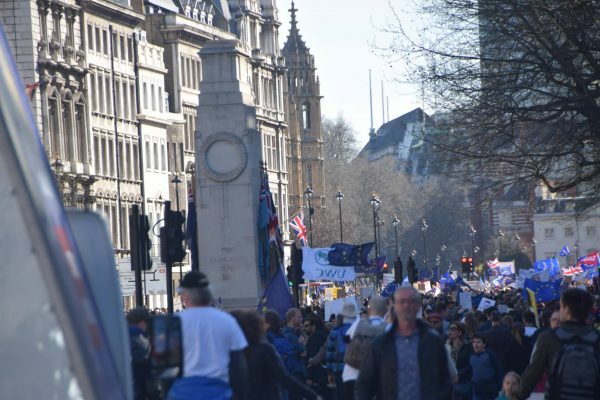 I joined the ‘Unite for Europe’ march in London on a beautiful crisp sunny spring day last Saturday. 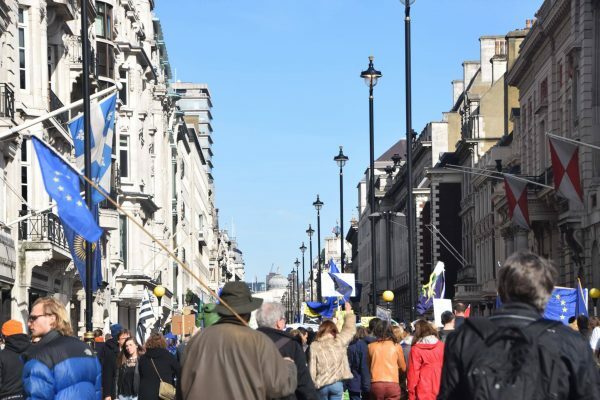 It was a perfect day for it and a perfect opportunity for a traffic free stroll at a safe and leisurely pace down the middle of some of the best streets in Westminster – Park Lane, Piccadilly, St James, Pall Mall, Trafalgar Square, Whitehall and Parliament Square. I know from attending football and rugby matches what a 50,000 crowd looks like and this crowd looked like twice that. When we move around cities we tend not to look up in case we walk into something or get run over but this march offered the perfect opportunity to take in some amazing architecture afresh and enjoy the drama of such large and colourful crowd in an impressive streetscape. So much of these streets is built of Portland limestone that it felt like the march was snaking through canyons carved out of a single solid stone block. In a way the streets really are that – the big block that is Portland island. I visited one of the quarries there a number of years ago to select stone for a building in the City of London and delighted in standing at the foot of it with fresh air above my head where once existed the stone from which whole swathes of London were built. The consistent use of Portland stone throughout parts of the heart of London allows buildings of varied styles and uses to sit happily together. In fact the uses are unimportant in terms of the creation of urban ‘fabric’ they are just the ‘stuff’ that sits behind the façades which may change over time (say from a bank to a café). Whilst many of the facades along the route we took are superb in themselves the most impressive part of it is that they all contribute to an almost continuous frontage which is greater than the sum of the parts. Place making and public space making – city streets and squares where each building is subservient to the whole. The opposite is an architectural ‘zoo’ where ‘object’ buildings do their own thing and the relationships between them and the spaces in between make little or no sense. The idea of the European Union is also that the whole is greater than the sum of the parts. We all have to give up something to get something more. You’d have to have a heart of stone not to see that. Most of us love a summer heatwave – the chance to imagine for a few days that we are living in the south of France. Me included – but my attitude changed a bit when I heard Professor Kevin Lomas of Loughborough University on BBC Radio 4’s ‘You and Yours’ (2 March 2017) outline research published in the Building Research and Information Journal which describes future heatwaves as a ‘public health disaster waiting to happen’ on account of building ‘overheating’ www.tandfonline.com/doi/full/10.1080/09613218.2017.1256136. The quest for building energy efficiency through heavily insulated walls, windows and roofs and reduced ventilation has led to buildings which are positively dangerous in heatwave conditions. 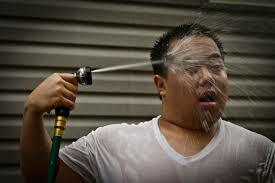 The European heatwave of 2003 led to the premature deaths of around 15,000 people and with climate change causing warmer summers and more frequent and intense heatwaves deaths related to ‘overheating’ could triple by 2040. The risk due to the way some modern buildings are constructed is combined with higher external air temperatures (due to global warming) and an aging population (who are more susceptible to the effects of overheating). The risk is increased in cities and in building types such as houses, care homes, hospitals and single aspect blocks of flats especially where there are large unshaded glass areas and low levels of ventilation. Professor Lomas argues that the Building Regulations need to consider climate change and the effects of overheating and poor air quality not just thermal insulation and ventilation. It seems to me that we are suffering or about to suffer from the effect of bad, cheap and ill considered buildings. Architectural science is not rocket science and there is no excuse. I speculate that the reason has been a lack of thought, even common sense, at the design stage combined with a low design and construction budget and the the use of ‘lightweight’ (usually timber frame) constuction. The performance of a building needs to be thought through before ‘the first turf is cut’ not in retrospect or by trial and error as the work proceeds. Buildings need thermal mass in the form of ‘heavy’ concrete floors, brick chimneys etc. to store heat and provide ‘inertia’ against temperature fluctuations, they need shading to windows and the facility to allow windows to be opened at the right times to allow fresh air to pass through the building. They need adequate levels of general background ventilation. Airtight windows are in my opinion potentially deadly to the old and the very young and for that reason I have never been comfortable with the low levels of ventilation promoted by the ‘Passivhaus’ ultra-low energy standard. Given that there are those who will only ever do the minimum necessary under the Building Regulations there will need to be a new regulation to prevent the construction of buildings that are highly likely to overheat in the summer. One of the best bits of our new found ‘fogey’ status as members of the National Trust has been to visit a number of the landscapes of Lancelot ‘Capability’ Brown. We visited Petworth House and Park recently www.nationaltrust.org.uk/petworth-house-and-park which is one of his best. Our visit coincided with a 300th anniversary exhibition and a good talk about him which persuaded me to purchase Jane Brown’s definitive biography ‘Lancelot ‘Capability’ Brown, 1716-1783: The Omnipotent Magician’ which I’ve just finished. I wouldn’t particularly recommend it unless you want to know the minutiae of his day to day existence. 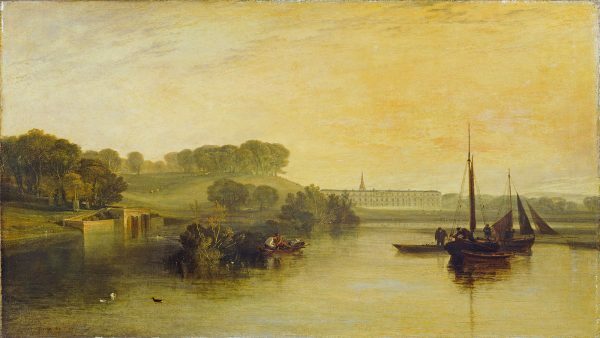 I wasn’t unaware of ‘Capability’ Brown – it’s just that I hadn’t taken the trouble to find out who he was and what he and the 18th century English Landscape Movement were about. His is one of those names you hear about without quite being able to picture what it was he did which is hardly surprising since his work was about making landscapes which looked natural whilst being entirely man made. In fact like many others I’ve been to some of his landscapes over the years without giving him a second thought (Blenheim Palace – to see Churchill’s birthplace and Longleat – to see the lions). 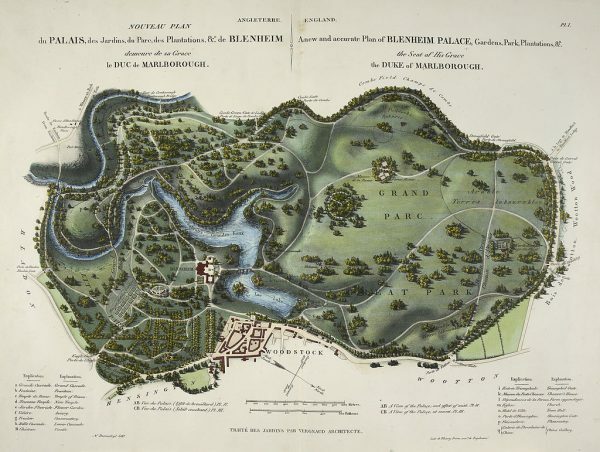 ‘Capability’ Brown was the leading exponent of the English Landscape Movement which held that landscape should be inspired by nature and complement architecture. It replaced geometric layouts with an ‘arcadian’ vision of an idyllic pastoral paradise where man and nature co-exist in a setting of natural beauty in perfect harmony. 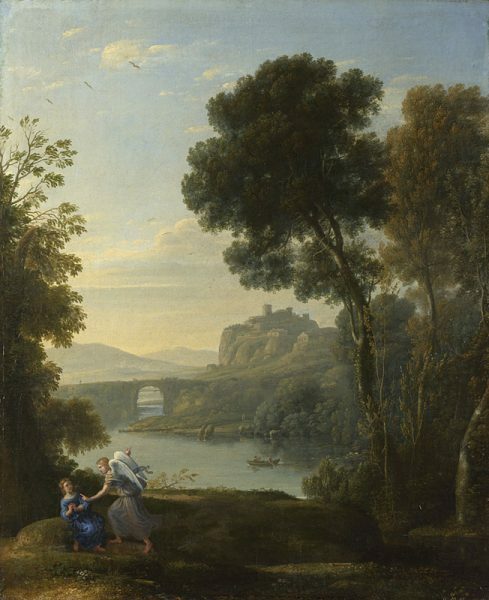 It was influenced by the work of the French painter Claude Lorraine and begun by the landscape designers William Kent (1685-1738) and Charles Bridgeman (1690-1738). Just as it is not necessary to visit all the buildings by a famous architect to get the ‘general idea’ it is not necessary to visit all of Brown’s landscapes to get a clear understanding of what he was about which is just as well as he was prolific and much of his work is ‘up north’. The components of the ‘classic’ Brown landscape were water engineering and earth moving on an often monumental scale to create views (panoramic and framed), rolling lawns, walks, driveways, lakes (preferably ‘serpentine’ ie winding or twisting), rivers, bridges, hills (man-made if necessary), trees (both individual – esp. the imposing Cedar of Lebanon – and in clumps and ‘ribbons’) and buildings and follies strategically set in the landscape. There is something surreal about these landscapes – natural but not quite natural – and my wife dislikes them for this reason – but it has been fun discovering his work. It is good to know that so much of it still survives and to see him being celebrated on the 300th anniversary of his birth. I grew up with a bit of ‘socialist realism’ on my bedroom wall for a few years in the form of some giant posters which my sister brought back from a school cruise to the Baltic that included a stop at St Petersburg and an onward visit to Moscow. They were remarkable for their depiction of unfeasibly muscular workers holding spanners like the chorus line from a West End musical with stars and tractors etc in the background. Or at least that’s my memory of them. They hit the bin when my taste in posters changed to rock and roll. 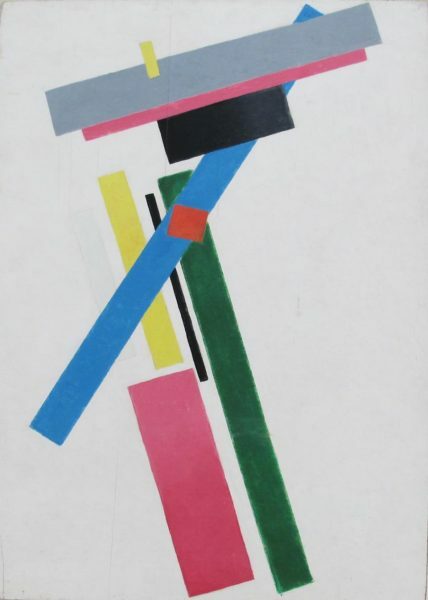 I had no idea of the history or meaning of this Russian propaganda art or the Russian avant-garde art that came before it. Revolution: Russian Art 1917-1932 at the RA is a fascinating exhibition with a palpable sense of tension and ultimately of doom running through it www.royalacademy.org.uk/exhibition/revolution-russian-art . Well worth a visit. Why these dates? 1917, the date of the Russian revolution, is obvious enough. Less well known is that 1932 was the date when Joseph Stalin was sufficiently powerful to totally suppress avant-garde art and replace it with a form of art as propaganda known ‘socialist realism’ which glorified communism. This exhibition covers the 15 year period, starting 100 years ago, that started with hope and ended with despair for many and much worse for some. 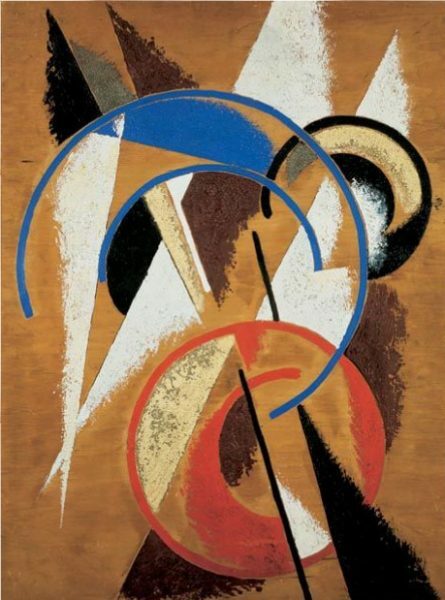 At first the avant-garde welcomed the opportunities that the revolution promised and during the early period much important work was produced. 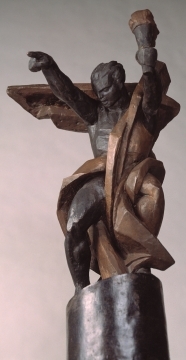 However by the early 1920’s the restrictions of an increasing repressive state were being felt and most of the artistic community was totally disillusioned with what the revolution had brought. Throughout the period Russia was in turmoil with the end of World War I, the Civil War 1917-22, ‘War’ communism, the New Economic Policy and the advent of central planning and the first Five-year Plan in 1928. 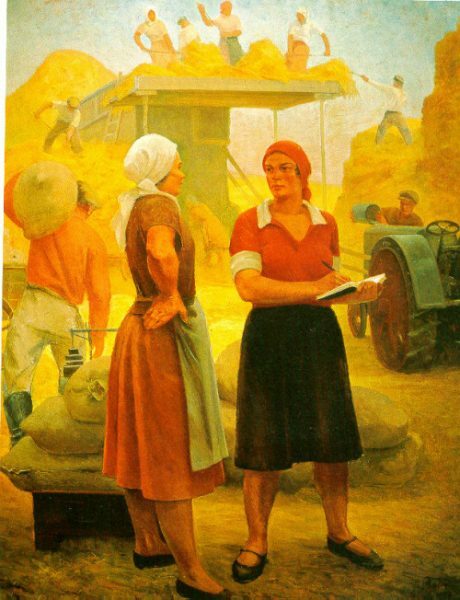 In 1932 Stalin made the Union of Soviet Artists the sole arbiter and propaganda the sole purpose of artistic endeavour. The exhibition displays the tension between the work of progressive artists and the emerging propagandist artists. By 1932 the matter was settled. Many of the progressives were silenced, exiled or executed including many who had at one time held out much hope. So for me this says beware of ideology and be careful what you wish for. In a modern context that includes the mini -revolution being promoted by the currently triumphant ‘Brexiteers’. A few years down the line the reality of the future they’ve chosen might not look so bright. Is that it? seemed to be the general response to the Housing White Paper ‘Fixing Our Broken Housing Market’ which was published last week http://www.bbc.co.uk/news/uk-politics-38884601. The White Paper was short on ambition or the promise of radical reform. But one thing we should be grateful of is that the White Paper did not give in to the clamour from the volume housebuilders to permit development on green belt land. It would have been the thin end of the wedge and once undeveloped land is gone it’s gone for good. Plenty of suitable brownfield land is available in areas where infrastructure such as roads, utilities, schools etc already exists and there is enormous opportunity for increased density in already developed sites across the country. It is just that from the volume housebuilder’s point of view brownfield / already developed land is unattractive as it requires ‘expensive’, imaginative, one-off solutions to unlock the development potential whereas rolling out standard house types and estate layouts like so much wallpaper is an easy tried and tested money maker for them. As well as this these anonymous suburban developments are basically unsustainable relying, as they do, on an unsustainable car-based way of life. We need to recognise that human patterns of development will need to return to the concepts of the village, the town, the neighbourhood and the city – not suburban sprawl. We joined the National Trust six months ago and have been having a lot of fun visiting various the trust properties in these parts. The trust acquired many of its country houses and gardens in the mid 20th century in lieu of death duties. The rate of acquisition of new properties has since declined with the emphasis now on parcels of coastline, forests, moorland etc. To be considered, new property acquisitions must be fully resourced for future management and maintenance. Wentworth Woodhouse is a grade 1 listed early 18th century county house and gardens in South Yorkshire. It is one of the finest and grandest country houses in Britain with the longest façade of any of them. It looks like a city in its own right and it’s hard to imagine what all the rooms were used for in its heyday other than for show. The chancellor’s grant is a relatively small sum to bring up in the autumn statement but he probably needed to pull some sort of ‘rabbit out of the hat’ in the midst of a bizarre financial statement predicated on a self-inflicted £60 billion (give or take the a few tens of billions ) Brexit ‘black hole’ over the next five years. 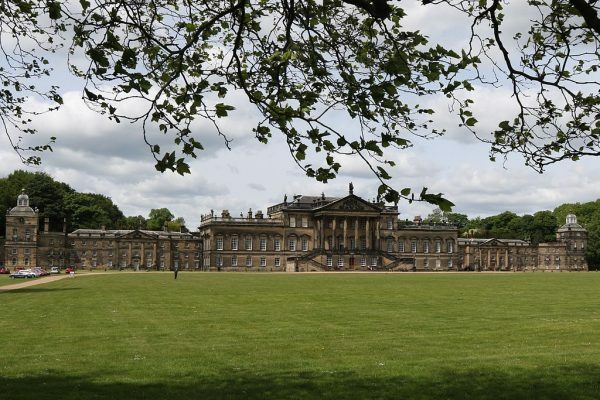 In fact the house has been secured by the Wentworth Woodhouse Preservation Trust and SAVE Britain’s Heritage. They purchased it for £7 million which is a bit of a ‘snip’ for those of us who are used to house price levels in London and the South East. In Kensington, £7 million will buy a semi detached villa. The chancellor’s additional money will effectively pay for fixing the roof. Public opening of the main interiors and gardens will be run by the National Trust. I’d never heard of Wentworth Woodhouse, probably as it is not local and not yet on the ‘heritage days out’ list, but hearing of its rescue was a pleasant surprise and I look forward to visiting it courtesy of my National Trust membership. It’s funny how we can finally find time to read things years or decades after we were ‘supposed’ to read them. I read my way through the canon of classic children’s stories not as a child but as bedtime stories for my kids. I read some of the ‘set texts’ we were supposed to have read before entering architectural education decades later. 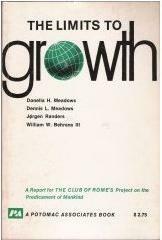 Similarly I’ve just read the 1972 classic ‘Limits to Growth’ – the top selling environmental title ever published. I’d read numerous references to it over the years and thought I was broadly aware of it’s contents but decided to read it when I found it available as a free download at the website of Parliament’s UK All-Party Parliamentary Group (APPG) on the Limits to Growth http://limits2growth.org.uk/ which was set up earlier this year. I’ve also just read the ‘Limits to Growth 30 year update (2005)’ and the Parliamentary Group’s own ‘Limits Revisited’ paper. Once you get started, these titles are so compelling in terms of our current predicament that it’s kind of hard to put them down. ‘Limits to Growth’ is a genuinely ‘jaw dropping’ read – one of those ‘this book will change your life’ type titles. It looked at the implications for the planet of the continuation of existing growth trends (population, resource use and emissions). In particular it looked at the impact of exponentially increasing consumption against the fixed limits of the planet (natural resources and the capacity to absorb emissions from industry and agriculture). The research that underpinned the work used ‘system dynamics’ to look at how different components of a system interact – often in ‘feedback loops’ or other non-linear ways. The components used were population, industrialisation, pollution, resource depletion and land availability for food. 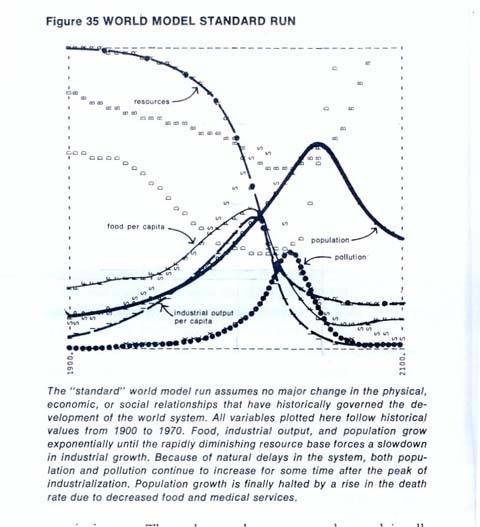 The conclusion of ‘Limits to Growth’ was that if human behaviour did not significantly and immediately alter then the human race must expect exponential growth to be followed by overshoot and collapse some time this century. This ‘business as usual’ scenario was labelled the ’standard run’. Other scenarios that assumed some change only pushed the date of overshoot and collapse back by a surprisingly short period. A number of scenarios that involved stabilising the human population, restricting industrial output per person and various technological solutions were capable of establishing ‘equilibrium’. Whilst ‘Limits to Growth’ has been challenged on points of detail nobody can challenge the collision between exponential growth and fixed limits and the long term need for ‘equilibrium’. The question is whether we manage this transition or allow it to happen chaotically. The consensus is that little has happened since 1972 and tragically we are still following the trend curves set out in the ‘standard model’ towards overshoot and collapse. All the more worrying then, and at the limits of believability in the circumstances, to hear US President elect Donald Trump announce that he is going to ‘make America great again’ by effectively setting the clock back 30 years or more in the ‘rust belt’ states, burning coal and gas and abandoning the Paris climate agreement https://www.theguardian.com/us-news/2016/nov/13/trump-looking-at-quickest-way-to-quit-paris-climate-agreement-says-report which is one of the few concrete measures adopted globally to try and start to get a grip on things. Trump can get away with this because until the limits of growth are reached it will seem to many like business as usual. But the global limits will be reached and when they are those who suffer from things like starvation will be the world’s poorest. It is good news for those in housing need that government ministers are planning up to 100,000 prefabricated homes (‘prefabs’) to help solve Britain’s housing crisis http://www.telegraph.co.uk/news/2016/10/29/britain-set-for-new-wave-of-prefabs-to-help-tackle-housing-crisi/. The last time that there was such an ambitious plan was in the aftermath of the second world war so what’s the reason this time? Basically the construction industry in general and housing in particular is a convenient tool in the government’s regulation of the economy through bringing forward or postponing investment. As well as this housing is a political ‘football’ – free market versus state provision and in many cases a class of investment rather than a means of shelter. Instead of a steady stream of new housing there is under supply followed by, in this case, the emergency provision of ‘prefabs’. Decades of stop / start have led to the loss of traditional construction skills and weak supply chains. 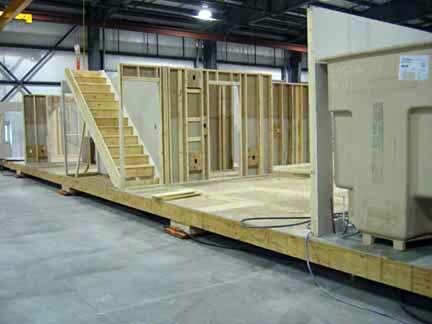 The ‘prefab’ ‘solution’ will involve the replacement of site based construction trade skills with less well paid factory jobs both in the UK and overseas and a much less rewarding way of life for the workers involved. I would not include factory work as one of the notable features of contemporary civilization. Regarding the ‘prefabs’ themselves they have advantages but also disadvantages. They are standardised so not site specific. They are relatively difficult to alter and extend as their design is so specific to their form and repairs will depend upon the form of construction whether framed or panelised. Whilst their ‘lightweight’ construction is well insulated it has no thermal mass to even out temperature. There are bound to be issues with sound insulation and fire protection. The industry will no doubt argue that all of these issues have been addressed – which they probably have been up to a point. The main attraction of ‘prefabs’ is cost and speed but short term cost does not equate to long term value and the only reason that speed is a bonus is because of the housing emergency we have put ourselves in. Still – something is better than nothing. 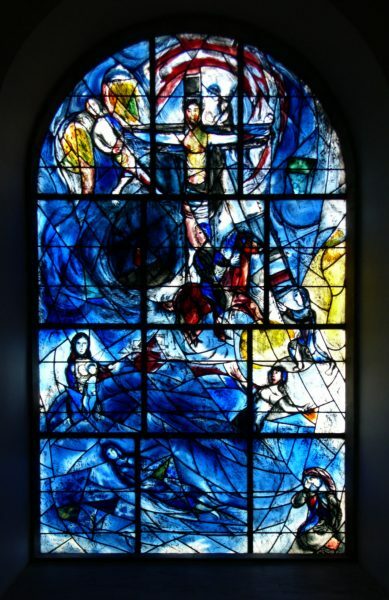 I’ve been meaning to visit ‘the church with the Chagall stained glass windows’ in Kent since a neighbour told me about it several years ago. The church in question is All Saints’ Church http://www.tudeley.org/allsaintstudeley.htm which is hidden away in Tudeley near Tonbridge. Parts of the church date from before the Norman conquest but most of what is there today is from the 18th century. 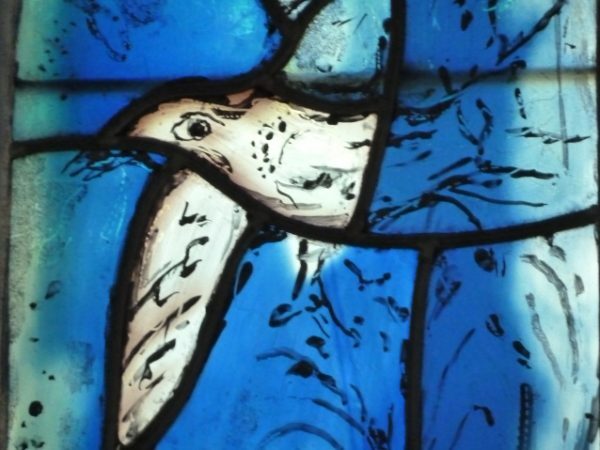 All the more surprising then to find within the relatively small window openings of this solid little church the only example in the world of a full array of stained glass windows (twelve in total) designed by the Russian – then French – artist Marc Chagall. 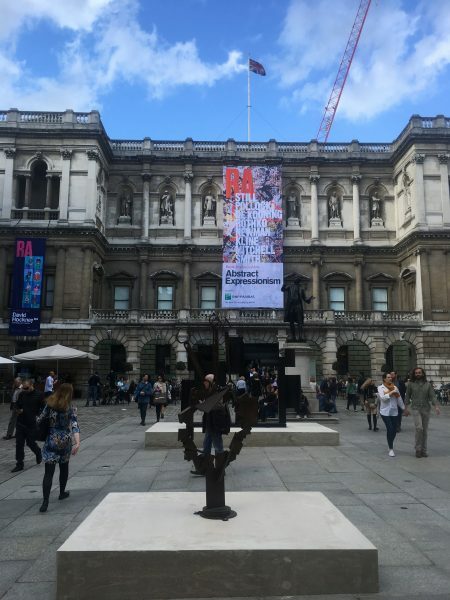 It’s a wonderful exhibition – a big show that brings together big and important pieces by Pollock, Rothko, Still, de Kooning, Newman, Kline, Smith, Guston and Gorky with a sense of the energy and experimentation of New York in the 1950’s. This was the age of jazz, beat poetry, the nuclear bomb and a frenzied desire to defy convention and forge a new art. 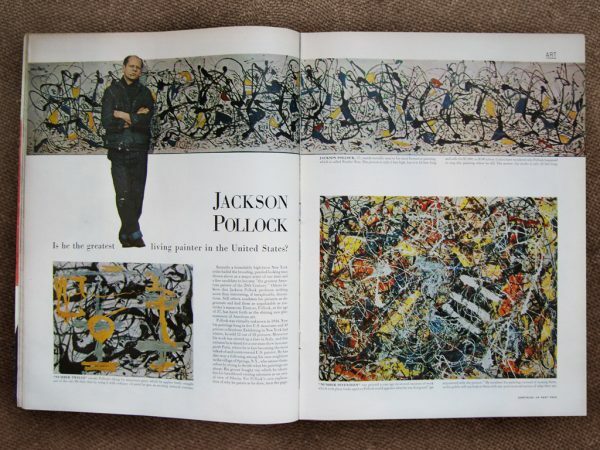 Pollock is the star of the show for me especially the room that features his masterpiece ‘No. 11 1952’ (‘Blue Poles’) en.wikipedia.org/wiki/Number_11,_1952_(painting), which is in his fully developed style, opposite ‘Mural’ – a work he did in 1943 on commission for Peggy Guggenheim in a developing style influenced by Picasso’s Guernica (1937). ‘Blue Poles’ caused a bit of a nuclear explosion in its own right when it was purchased by the National Gallery of Australia in 1973 for what was then a large amount of money – let alone for something that many thought had no value at all as ‘art’. I would have liked a bit more information on the social and cultural context of 1950’s New York. We purchased the film ‘Peggy Guggenheim- Art Addict’ which we found amongst the Abstract Expressionist cups, scarves and postcards etc in the RA shop on the way out which filled in some of the background. If they were able to bottle and sell the hope, confidence and enthusiasm of the Abstract Expressionists that would really sell out fast.